Sometimes when I start out with a recipe, I have no idea where I’m going. I have a basic idea in mind….but usually my basic idea falls to the wayside. 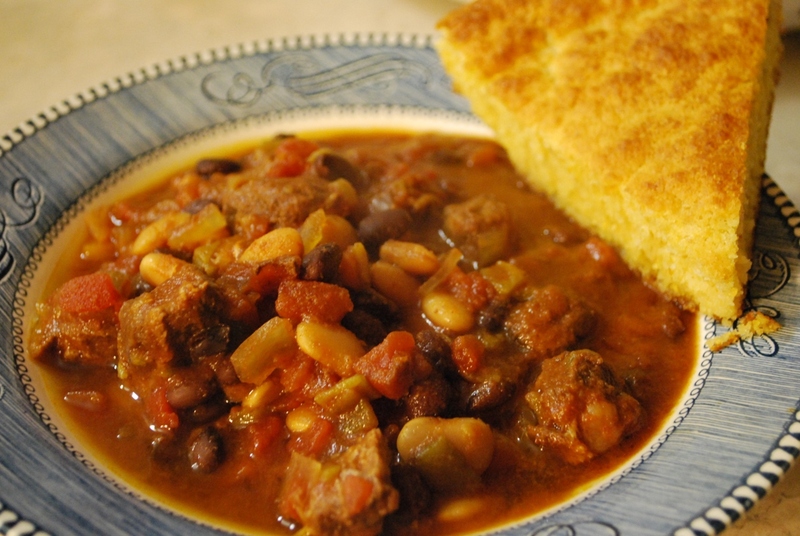 I was going with a traditional chili when I started, but then I decided to switch it up a bit and add some more color – then Calico Chili was born…..and I added the name Texas on it because I used stew beef instead of ground beef. Stew beef is bigger. Everything is bigger in Texas. Can you see my reasoning here? 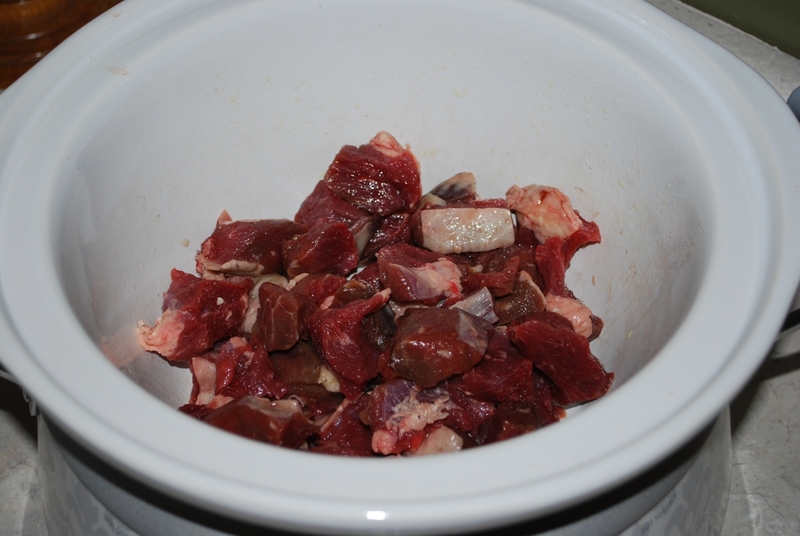 In the bottom of a greased crock pot, put 1 ½ pounds stew beef. I had to pick the fat off of mine. The last place we got our beef processed was pretty lazy. They just threw the fat pieces down into the meat pack before they shrink wrapped it. Some of the pieces down in there were more than half fat and very little beef. Therefore, we will not be going back there for meat processing. Treat me right, you’ve got my business. Treat me shabby – I’m going somewhere else. Amen. 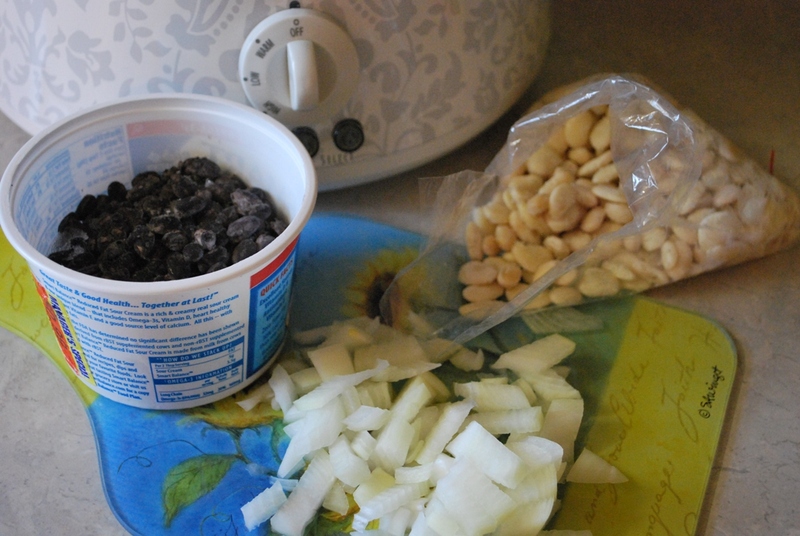 You’ll also need 1 ½ cups black beans and 1 ½ cups white beans, already cooked. These are from my freezer because I do batch cooking with beans in the crock pot. When I need beans for a recipe, I just make a huge batch and freeze the rest. They’re nice to have on hand whenever I need them. You’ll also need about ½ cup chopped onion. And just wondering…..am I the only one who still sings the Bean Song? They’re good for your heart, ya know. Let’s just get something out of the way – I know canned tomatoes aren’t the best for me because of the lining in the can. Let’s also get something else out of the way – I’m saving for a house and our budget is a little tight right now….I cannot afford tomatoes canned in glass jars (we’ve had a bad two years in the tomato field). So, the responsible thing for me to do is buy the tomatoes I can afford instead of going into debt for what everyone else says I should be eating. 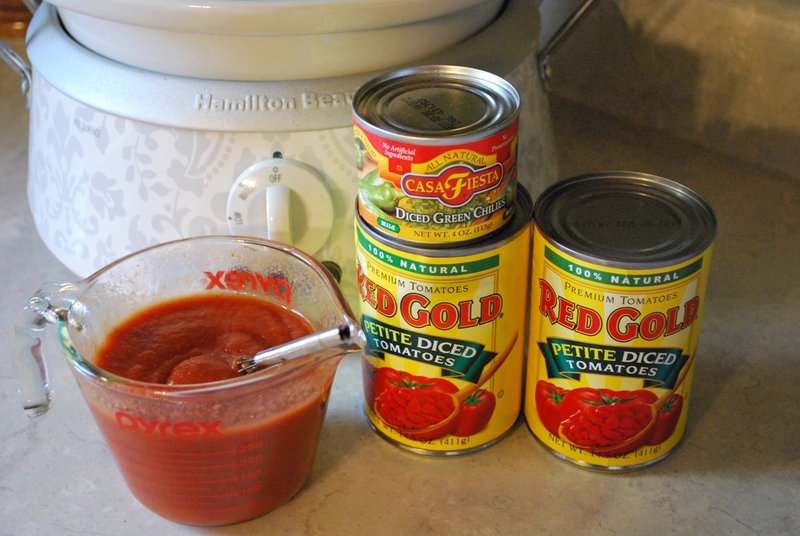 In this recipe you’ll use two cans of diced tomatoes, one can of tomato paste mixed with water to make 1 cup, and a can of diced chilies. 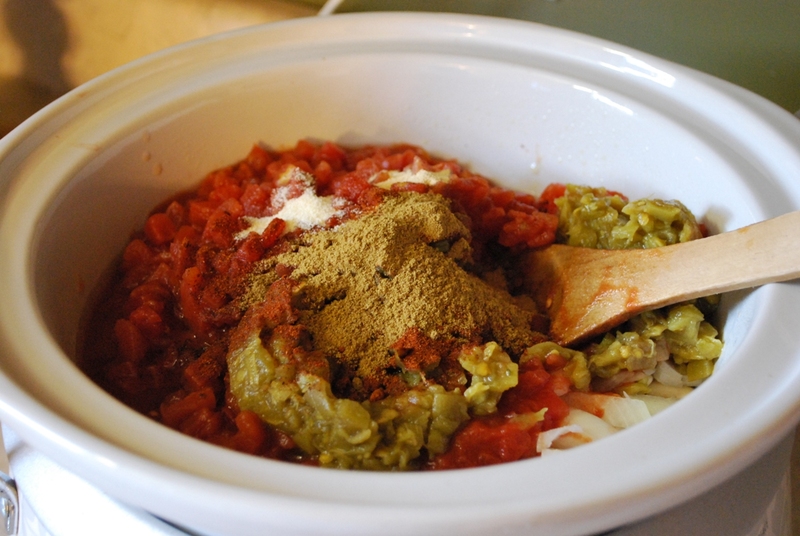 Throw everything together in the crock pot along with some onion powder, garlic powder, cumin, and chili powder. Give it a good stir. Don’t you just love things that can be stirred in the pot so nothing else gets dirty? Can I get an Amen?! I cooked mine about 9 hours and then left it on warm for the last hour….and I got THIS. Hello beautiful. Served alongside of a piece of skillet cornbread, you’ll have a happy family. And a happy tummy. You can quote me on that. 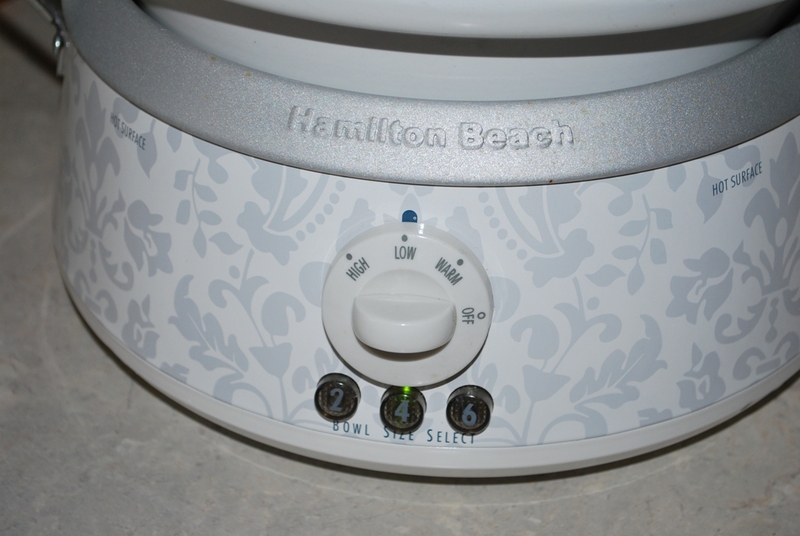 Combine all ingredients in 4-5 quart crock pot. Stir well. Cover and cook on low for 8-10 hours. Serve with cornbread. *This post is linked at Fat Tuesday on Real Food Forager and at Hearth and Soul Blog Hop on Penniless Parenting. Anyways, I’m working on stocking my freezer for the upcoming birth of my second child. I would love for you to come share this recipe at my Make-ahead Monday Link-up over at Raising Isabella! 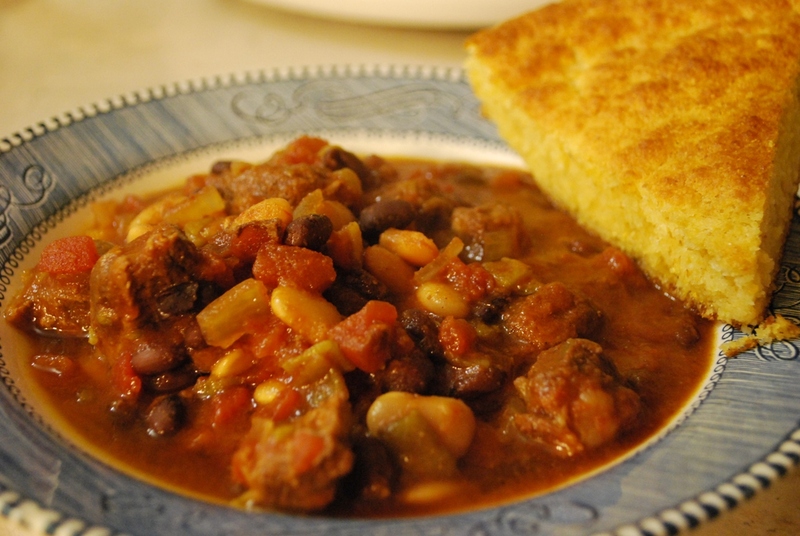 Chili is fabulous for cold weather! This sounds like a really delicious, nutritious and frugal recipe. Great comfort food! Thank you for sharing it with the Hearth and Soul hop! Yum! I love all kinds of chili! Me too! And big chunks of beef are always a plus! Wow! Another yummy recipe of yours for me to try. Can’t wait! I appreciate your honesty about the tomatoes. I’m in the same boat you are. I did can some tomatoes last year, but we are almost out because it was a bad tomato year here too. So I am gonna have to buy some in a can too. For Becca who wants a garden–Have you thought about raised beds? You don’t need a tiller then. This is what I use and I have added new ones almost every year. I now have a sizeable garden without the hassle of a tiller. I would LOVE to have some raised beds! I might have to un-decided the whole “I’m not going back to the farm we get our meat and dairy from before moving” thing. This looks good. And I’m out of butter. I should just get it over with and go already. I buy tomatoes in a can. I don’t mind too much if I break something cheap, but, this tiller was not cheap. Not.at.all. I canned tomatoes 2 years ago for the first time. I really want a garden this year, but my husband works so much it’s hard for him to work it. I am pretty garden stupid myself. I asked him if he’d show me how to work the tiller, but I never got an answer. It think it’s because I break stuff. Hmmmm. I break stuff too. And tillers scare me. They’re…destructive. That, along with me, is not a good combo. Try a square foot garden – no tilling whatsoever. A little expensive on the front end, but you have great soil with little weeding and an unbelievable amount of vegetables. Then you can can all the tomatoes you want in glass jars! 🙂 I hope to have raised beds one day. 🙂 That’s why I put in the post that we’d had a bad few years of tomatoes on the farm….we haven’t had any to can. But I do LOVE home canned tomatoes! Yum! Unfortunately I think I am the only one in the house who would enjoy this:( Maybe when my boys are older they will appreciate cooked tomatoes and peppers!